As I may have mentioned I teach Head Start. I had taught private church run preschools in the past, but had taken several years off to work in healthcare. I started with Head Start at the end of last school year. Boy was I out of practice. 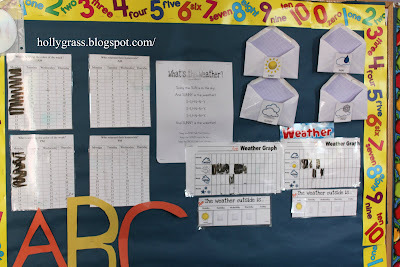 I had lost what "flow" I had for doing circle time (calendar time) and the children could tell. They were unengaged, uninterested and unimpressed with this new teacher that stepped into their room. I vowed that this year would be better. 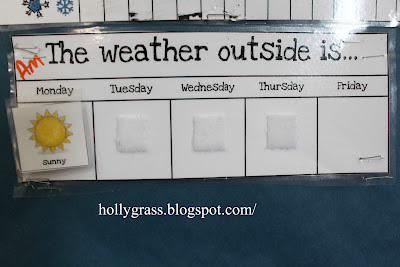 Whats the weather like today. The weather person tells me what the weather is and as they are adding the appropriate pic to our weekly graph I chart the monthly graph and we sing. And sunny is the weather. I think I got this from CanTeach If I really got it from you, I apologize. Please let me know so I can credit it to you. This is what the weather graphing area looks like. I have the picture cards stored in envelopes with a picture of whats inside on the outside. I have 2 of everything, because I have a morning and afternoon class. I do the same routine everyday...twice a day. 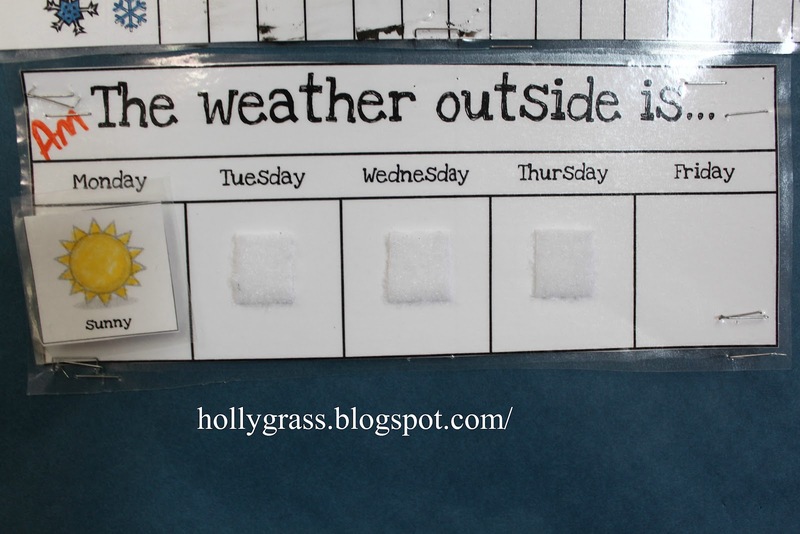 Here is a close up of the monthly weather graph. 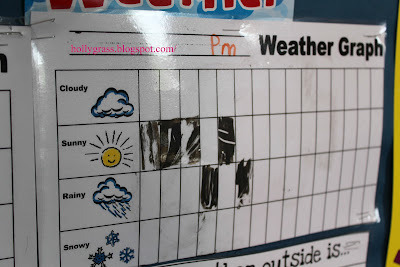 This is a close up of our weekly weather graph. Next we move on to Letter of the week. They tell me what the letter is and we try to tie it back to our theme. An example is, this week's letter is V and we talked about Veterinarians. Then the number, we clap it and also talk about something related to our theme. This weeks was the number 2 and we talked about pets with only 2 legs. Then its Shape of the week. I like to name the shape and the describe it. This week was a square. Everyone pointed out the 4 sides, but I mentioned a rectangle also has 4 sides. This lead to a discussion about the word equal. Color of the week is Black and we counted how many of us are wearing black and then we graph it. The above picture was taken last week, just so you don't think I don't know the difference between a u and a V.
Next up the calendar helper tells me the month, date and day. Shew finally time to talk about the lesson of the week. I sit in the floor with them and we have a discussion about the topic. Lots of what if's, why, and how come, gets asked in my room. All in all this takes maybe 10-15 minutes.